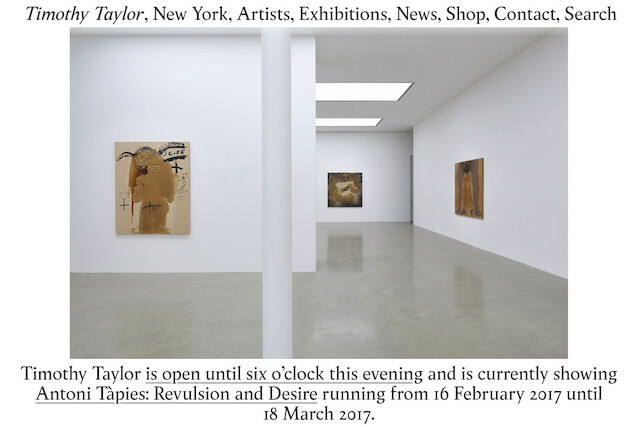 Zak Group has designed and developed the new website of Timothy Taylor, the London and New York based commercial art gallery, which uses integrated technologies to engage with established and emerging audiences. The use of digital inventory management systems, transparent artwork pricing, social media and a fluid new identity conceived for the screen, are innovative in an industry that has been defined by staid practices of exclusivity, scarcity of information and an emphasis on bricks-and-mortar over digital presence. The website uses an open-source content management system that gives the gallery great flexibility in authoring new pages and managing an archive of over twenty years of exhibitions. Individual artist pages aggregate selected content from across the internet to chart the artist’s practice in addition to featuring recent artworks, news, publications and videos. Social media integrations enable the gallery to include Instagram posts that mention the artist or gallery. The website utilises a custom integration of Artlogic—a fine-art inventory database system—allowing the gallery to manage and publish artworks to the website from a single centralised repository. The system enables the storage of extensive artwork information including shipping, location and ownership history, whilst maintaining comprehensive control over the online visibility of the gallery’s holdings. Timothy Taylor is one of the first to bring online price transparency to the commercial gallery sector. Price transparency is considered revolutionary in the art world as it allows for galleries to have more control over setting prices, a role traditionally assumed by auction houses. Visitors are now able to view artwork prices for the duration of the current exhibition through an email authentication process. A unique link is issued alongside a cookie saved on the user’s computer, both expiring upon the close of the exhibition. The identity of Timothy Taylor has been conceived with the screen as its primary medium while still informing the more traditional print based applications. The identity takes the form of a bespoke typeface and a tone of voice that informs all of the gallery’s written copy. Informed by research around heritage, British typography and specificity of place, both the website and identity strike a balance between establishment and experimentation.